There is truly something wonderful about doing a random act of kindness. It makes us feel great, the person we are doing it for fell great. As well as people around us feel great that witness it. A truly win-win-win scenario! If you have ever experienced a situation where someone anonymous pays for something for you. Like a coffee in a drive through. Or even your dinner. It makes an impact. That honestly is imprinted on our memories for years and years. Making a huge impact on our lives. What’s truly great about giving our random acts of kindness is that you can change someones life for the better. Temporarily and even long term. And what you reap you sow. So kindness is bound to come back to you in the same or entirely different form. It truly makes the world go around. Cycling itself back to you and to another over and over. But what are the best random acts of kindness you can use to make a small impact on peoples daily lives? Well I have you covered on that one my friends. As below are 365 RAK Ideas that you can use, one for every single day of the year! Walk an old lady across the crosswalk to make sure she gets there safely. Buy the coffee of the person behind you in the drive through. Write a letter to someone you love telling them how much you admire them. Or the top 5 things you are grateful for about them. Walk someones dog for them. Put money in a meter that is expired so the person doesn’t get a ticket. Give away clothing to someone on the street. Tell your spouse you love them unexpectedly. Pay off someones past due library charges. Buy sunglasses for a homeless person if it is bright out. Wash a car for a buddy. Pick up trash on your street. Reach out to an old teacher letting them know how much they helped you. Leave a huge tip for a waiter or some sort of hospitality worker. Write a thank you letter to a solider. Pick up a hitch hike. Share a cab with someone and pay the whole fare. Send your mom or grandma flowers. Pay for the haircut of someone getting cut next to you. Babysit a friends kid for free. Do your roommates laundry when you are doing yours and fold it. Put 10 positive comments on peoples blogs. Help a friend find a job or better job if they already have one. Hold the elevator door for someone or let people go in first before you. Send copies of an inspirational book to your closest friends. Let someone cut in line in front of you at the grocery store. Help an old lady put her groceries in the car. Create a thoughtful playlist for someone close to you. Make a meal for someone, breakfast in bed or bring lunch to a loved one at work. Bring donuts and coffee to your work one day. Leave a review on YELP about how awesome a restaurant and/or server was. Encourage a friend to go after their goals. Send a friend a $20 Amazon gift card. Let someone in when driving in traffic. Buy a friend a weeks worth of groceries. Buy the beer of the person that sits next to you at the bar. Offer to cover someones shift so they can have a day off. Smile at every stranger you walk by on the street for the day. Let someone borrow your computer or printer. Buy an umbrella for a homeless person when it is raining. Give a homeless person your jacket. Tell someone a funny joke. Offer to babysit for one of your friends or kid sit so they can get some time to themselves. Post a string of motivational quotes on social media. Say something super nice about the person that is being gossiped about. Pay someone an awesome compliment in front of a group of people. Buy someone a flower and leave it on their desk or doorstep. Volunteer at the animal shelter and bring treats for the animals. Create a digital album for a friend or the good memories you have created or simply pictures that you have taken the remind you of them. Call your momma and tell her how fantastic she is. Wipe down the windshield of a friends car when you guys stop at the car wash. Truly listen to someone without interjecting. Call a friend who is down and out and tell them they are strong and are going to get through it. Go play a board game with someone at an old folks home. Leave a dollar bill on the ground near where children are walking and watch how much joy they get from finding it. Reach out and thank your favorite company or brand for the products or services they create. Wipe down gym equipment since no one ever does so. Make a custom made shirt or hat online for a friend and send it to their address. Create a connection with two people you know that can make for a good professional or personal connection. Offer to be the designated driver for your friends one weekend. Truly thank your parents for doing the best they could to raise you. Donate all the things you don’t really need anymore to the Goodwill. Write a poem to someone. Donate a pint of blood or even plasma! Bring a sick friend a cup or soup and a hot chocolate. Go over and above to help someone that is lost. Converse with them about where they are from and how long they are staying. See the best in someone. Pass along a awesome book that you have just completed and write a quick note to the person about how you hope they get the most out of it. Tell your grocery checker that you hope they have the best day of their life. Pet someones dog and let them know how awesome of a breed they have. Help a mom carry her stroller down a curb or up a flight of steps. Compliment someone on their unique style. Laugh wholeheartedly at someones joke. Give your extra books to the library as a donation. Put out a cup of water when you see a dog leashed up. Leave extra money in the vending machine so someone can get a free snack. Give up your seat to anyone who needs it. Hold someones hand when they are sharing their hurt or pain with you. Go to a kids friends sports game and cheer them on. Text someone you care about and tell them you were thinking about them and hope they are well. Wave to fireman or policemen as a thank you for their service. Text a random number and tell them to have an awesome day! Reach out to the pastor of your church and tell him how awesome their messages are and how great he/she is at teaching their craft. Be kind to someone when they are being mean. Let a friend know your favorite quality about their child. Leave quarters in the quarter slot, enough for a load of laundry at the laundry mat. Call an old lady “young lady” or an old man “young man”. Shake the hand of every veteran you meet and thank them for their service. Send someone some preventative measures for cold season like vitamin C or a good essential oil. Tell your friend what your favorite quality about them is. Donate your computer to a student from a poor neighborhood. Email back a soliciting email with a kind word. Let someone know how great their marriage is and how great of a couple they are. Send an email of a funny joke to one of your friends or family members. Give a bottle of water to a homeless person. Write a positive message or quote on the sidewalk of a busy street where a lot of people will see it. Buy a fitness product for the person that always checks you in at the gym. Buy a lottery ticket or scratcher for a friend and put a note on it that you hope they win the big bucks! Put a couple kindness stones in the park or in random potted plants. Bake cookies or muffins and bring them to all the bank tellers at your preferred bank. Write a get well card to someone who is sick. Make a double portion of food that you bring to work for lunch and give it away. Give someone else the cab that you flagged down. Help someone put luggage into the overhead bin or grab it off the baggage claim line for them. Write an encouraging message, print out 10 copies and staple them on 10 trees in the neighborhood or on light poles. Call up a friend and laugh about your favorite memory with them. Let the person at the coffee shop have the cream before you. Give your friend the last slice of pizza. Send school supplies to your local elementary school. Offer to change a friends oil. Mail a thank you letter to a veteran. Return a couple shopping carts when you are walking into the store. Praise your boss either verbally or through a thank you note. Tip the musician that is playing on the street and tell them you hope they make it big. Do someone else’s chore in your household. Ask if you can grab anything for anyone when leaving the house or going outside the office. Offer to house sit for a friend while they are on vacation. Compliment someone on how well they have raised their kids. Throw a surprise party for a friend, or just because for someone you care about. Celebrate a friends victory or promotion by buying them lunch. Offer to take someone’s photo when they are trying to take one of themselves. Look for the best in a person. Bring someone a souvenir from somewhere you traveled to. Say thank you to anyone who helps you and mean it. Rally up a blanket donation on social media and bring them all to the homeless shelter. Paint or clean off graffiti. Turn your phone off when talking to people or simply put it away. Befriend the new person at the gym, in town, at work. Anywhere in your life. Give away your boxes to a friend that you know that is moving. Give someone working on your house, like the painter, electrician or handyman a soda or cold glass or water. Bring a candy bar to a friend at work. Offer help to a friend to unpack after they have moved or when they get home from a long trip. Send a copy of a photo to a friend of a good memory of you two. Run an errand for a buddy. Create a Go Fund Me page that takes donations that go to a local good cause in your neighborhood. Text a friend a simple “Good Morning” and tell them to have the best day of their friggin life! Pay way more than kids charge at a lemonade stand. Answer a question on Quora in your area of expertise to help someone out. Participate in a fundraiser near to your heart. Share your favorite recipe with a friend or on social media. Put away dishes your roommates left out to dry while you are cleaning up. Donate your old phones and phone chargers to “Cell Phones For Soldiers“. Buy a pack of gum for someone else when you are buying your own. Throw out the trash on the way out of your friends house. Start to recycle more often. Clean out the microwave at work. That thing gets nasty and everyone will appreciate it! Get up a little earlier each morning and give gratitude for the things and people in life you are grateful for. Give the person next to you a word of encouragement at the gym to keep up with the healthy habit. Text a friend a motivational quote. Pick up a weight or help unload weights for someone at the gym. Send a friend a nice lyric of a song that describes your relationship. Give your old bike to someone who doesn’t have a car. Help a friend shop for deals for their next trip. Deals on travel, expenses, fun etc. Offer someone a ride to an appointment or meeting where it takes forever to find parking. Bring in your neighbors trash cans when you bring yours in. Dedicate a song on the radio to a friend, family member or loved one. Share discount coupons you find with friends. Let someone know about a job opening that you saw. Offer a free weekend class that teaches kids what you know. Directly thank a police officer for the work that they do. Thank the mail man for always getting your mail to you on time. Offer up one of your sick days to someone who really needs a day off or stay late for a co-worker who needs to get home. Throw a block party and invite everyone. Hand out bottles of hand sanitizer for people during sick season or in general. Buy a book for a friend that is about the religion they practice. Tell your barista how much you appreciate them keeping you caffeinated and how you wouldn’t be the same without them! Call your grandparents and tell them how you loved that they spoiled you as a kid. Call the person that made the biggest influence in your life and let them know how much they mean to you. Offer to spot someone at the gym. Thank a soldier for their service and offer to buy them lunch or coffee. Grab someone else’s tray and dump it when you are at a fast food joint. Donate old toys to Toys For Tots so less fortunate children around the world can have a great Christmas. Read a book out loud to a friend or loved one. Even a magazine. Let them take a load off! Tell the parent of a crying child in a public place that you would be doing the same thing if it was socially acceptable. Run or walk a 5K for a cause you believe in. Bring extra coupons and give them out to people in line at the store you go to. Make a cup of coffee when the coffee is low at the office. Build a bird feeder and put it in the park and put food in it each week. Bring coloring books to the pediatric wing of a hospital. Meditate for ten minutes, this is self kindness! Buy the movie ticket for the person in line behind you. Thank the cooks at the restaurant you go to for cooking you such great food. Invite a co-worker or friend over for a home cooked meal. Thank your janitor for keeping your building clean. Send a note to the police station letting them know how much you appreciate them keeping you safe. Leave some change at the playground for kids to find. Make better eye contact when people are talking to you. Put flowers in a random mail box. Write a motivational or nice message on a napkin and leave it at the coffee shop or on the bar. Tell someone how nice their new haircut looks. Appreciate a guys beard growth by saying how folicaly gifted he is. Tell a lady how great she looks with the dress she’s wearing. Tell someone how funny you think they are. Leave a newspaper or magazine on the bench that you just read for someone to check out for free. Let someone cut in front of you who has less items at the grocery store. Listen to someone without responding at all. Let them vent! Grab the door for someone when they are coming in to a place that you are already in. Tell someone you believe in them. Tell someone that is sick or has a broken limb that you hope the experience the quickest recovery ever. Tell an elderly person how you appreciate how much wisdom they have. Pick a friend up from the airport. Clean the house so that your loved ones or roommates come home to a sparkling clean home! Tell someone how good it is to see them. Text someone that you just met up with or talk to about how you enjoyed the conversation and time they took to chat. Praise a co-worker to your manager. Either in front of them or without them knowing. Buy the bags for someone behind you in the grocery line, leaving the clerk a dollar for their bags. Reach out to someone who you lost touch with for whatever reason, and tell them how much the time in your life where you were together meant to you. And wish them the best life ever. Put a bowl of candy out at the office. Or healthy snacks to promote wellness! Put a friend on your gym membership for a month to get them going with fitness. Let go of the past. An act of self kindness for you. Offer a ride to a friend who doesn’t have a car or even carpool with someone to help them save gas. Bake cookies for someone. Who doesn’t love cookies!? Randomly ask how you can help someone in general or how you can help them get closer to their goals and dreams. Buy some toys for your friends dog. Buy a bookmark for someone we know who loves to read! Ask a waiter if they have recently received a bad tip that night and then make up for it by giving them extra money. Give a friend a BPA free water bottle that they can drink out of to help their health and save them money. Write a letter to an old enemy telling them you forgive them. Shout someone out on Instagram with your story or on your page about having your followers support them. Or just how much they have made an impact in your life. Meditate on the happiness of another person in your life. Put yourself in the shoes of someone you are mad at, so you can empathize with them. Buy an audio book for someone you know who commutes a lot. Leave your bus pass on the bench when you are done with it for the day for someone else to find and use. Pay to bridge toll for the person driving behind you. Put a kind note in the pocket of jeans or a jacket at the store that tells someone how awesome they are going to look in it. Talk to a lonely senior for a few minutes. Give thanks to nature and the life giving force it offers to us. So there you are my kind friends. A list of random acts of kindness and nice things you can do for people that can inspire us all to give out kindness wherever we go. To think of others before ourselves. And to act kind in the midst of what can often be a cruel world. Giving people hope that there still is goodness and good people out there. And inspiring people to carry on the same or similar acts in their lives. Setting off a chain of events that can change a persons life. A group of people. A community. And one day even the world at large! Lets keep this going my friends! 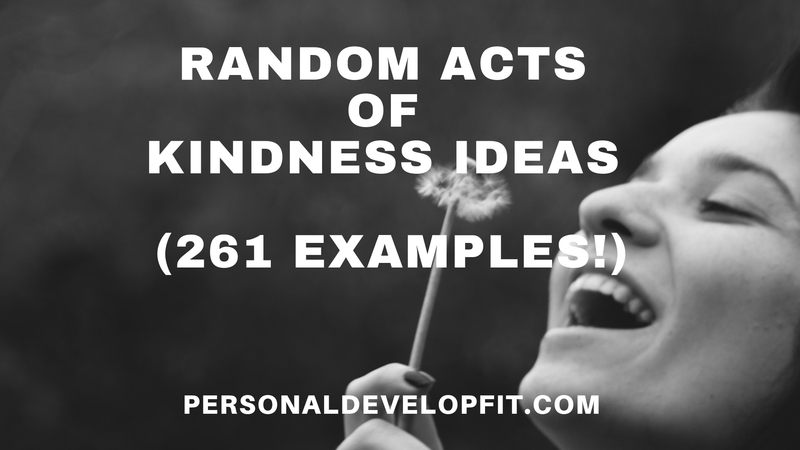 Share with me which of the random acts of kindness ideas you liked best. As well as if you have any good ones to add in the comment section below! “Everyone you meet is fighting a battle you know nothing about. Be kind. Always. “The seeds of kindness that you plant today will one day bloom in the hearts of all that you touch.